Colleen Brannon from Island Labour shares the speech she will make at tonight's full council meeting, in defence of the Law Centre, which provides help to vulnerable Islanders and says it saved the council between £1.5-£1.9m in 2017. 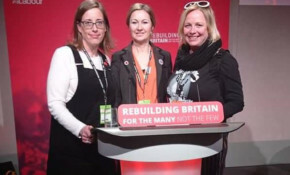 Female members of the Isle of Wight Labour Party came together last week and heard impassioned speeches about how Island women can help empower others to represent their communities. Colleen is asking Islanders to stand together on Saturday to protest against the proposed £5.5m of cuts to be made by the Isle of Wight council. She explains why she believes it's important for Islanders to come together over these plans. Save our Isle of Wight Schools campaign will be marching for SEN children and their families on Wednesday 30th. Meet at 2pm in St Thomas's Square, Newport. Event for those concerned about future of NHS services on the Isle of Wight? Regardless of the political affiliation, all are welcome to attend next week's screening of the documentary, Sell-Off: The Abolition of Your NHS, made by NHS professionals who have many decades of experience.